The service is almost over. The living nativity in the front of the sanctuary is becoming restless. Joseph is scratching his backside, the shepherds are balancing their heads on their canes, the angel of the Lord keeps shifting her weight and grabbing her halo to be sure it is still perched on top of her head, making it more crooked with each tap. 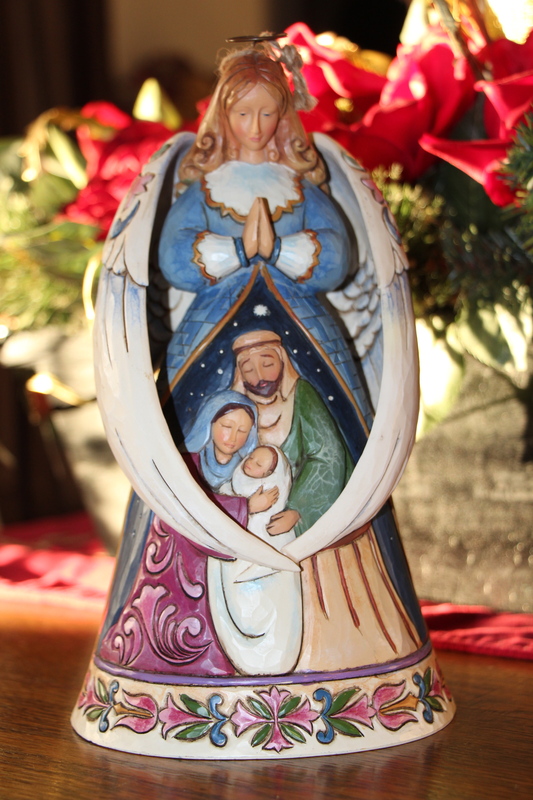 Only Mary and the Christ child remain still as statues—only because Mary is the most mature girl in the Sunday School class and the Baby Jesus is her doll from home. A hush comes over the congregants as the lights dim to near darkness. The acolytes light their candlelighter wicks from the candle-lit advent wreath in the front corner of the sanctuary. People feel around their seats in the dark until they locate their own little white candle with the cardboard drip-catcher stuck lopsided around its bottom half, and stand patiently, expectantly, as the acolytes walk down the middle sanctuary aisle lighting the candle of the person at the end of each row. The smells of warmth, wax, and glow mingle with the evergreen boughs decorating the stained glass windows, while slowly, the tiny flame of each candle expands from the middle of the room to its furthest corners creating an aura of flickering light out of what was moments before a shadowy darkness. The silent night has arrived. Even our little nativity still themselves in its glow. Is that what the parents of Messiah looked like the night of His birth? Just a couple of gypsies? Just a couple of gypsies. How did a baby nearly born on the side of the road—an outcast before he arrived—end up the center of a movement that has set the world ablaze by His single inextinguishable light? A movement that should have died two thousand deaths these past two thousand years, but instead grows stronger—especially in the face of persecution? My pastor often says we are living in New Testament times. He has taught many Sunday School classes and preached many messages comparing the cultures. I must say, he makes a strong case. We live in a society that teaches there is no Big Picture. There are no moral absolutes, or at least what used to be moral absolutes are somehow morphing into an image that strangely resembles that which used to be absolutely immoral. The persecuted church cries for mercy around the world. Every day Christians are discriminated against, imprisoned, tortured, mocked and even killed for their unwavering faith in the gypsy baby born 2,000 years ago. In America, it isn’t fashionable to be a Christian. Not only is it not fashionable (aka—culturally acceptable), it is often not tolerated. In the arena of ideas, it seems every other set of values is allowed voice, but Christian values. Christian values are intolerant. Strangely, society doesn’t see this as a contradiction. Yet, the Flame remains lit and flickers its light in the darkness. It is a light first shown to the shepherds and now given individually to shepherds-at-heart. Fellow gypsies, I suppose. Once lit, their flame cannot be distinguished. And collectively, their light fills the darkness so that the darkness cannot overcome it. Imagine that. An outcast baby born on that first Silent Night, powerful enough to give us His light—just a little flickering light–in such a way that nothing formed against it has prospered. Instead, the light He gives–the one that often seems so frail, so weak, so incapable–is really the strongest thing one can ever possess. This is heart of true Hope. A hope that leads us to Peace—peace that really does surpass all understanding. Peace that says, “Rejoice!” even when circumstances appear contrary. And in the heart of our rejoicing, we experience the truth about Love—it always begins with sacrifice, and the sacrifice is always for us first. It is the story of Christmas. Light your candle. Stand in the center of His Peace. For He longs to hear your rejoicing, and His banner over you is Love. Thank you for wondering with me this Advent season. I have loved wondering together. I will see you in the New Year—grace and peace to you and yours this Light-filled Christmas!